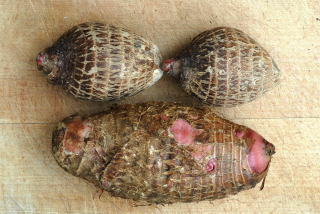 Xanthosoma sagittifolium or Coco yam. The picture above shows the elephant ear plant growing in all its glory. Luckily for us Xanthosoma, also known as the coco yam, is widely grown as a food crop through out the tropical world. 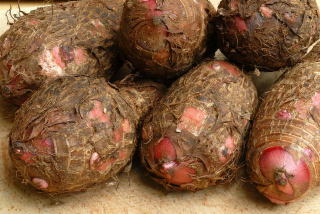 Even better, the tubers of the plant are then sent all over the world for people to eat. So if you are unfamiliar with this vegetable you will need to locate your nearest Afro-Caribbean grocer. 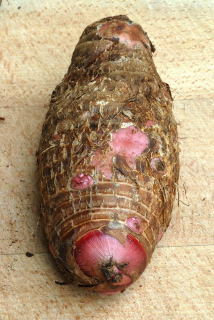 What you are looking for are Xanthosoma, sold loose by the kg under the name of coco yam (in the UK at least). Choose a shop with a high turn over to ensure your elephant ear tubers are nice and fresh. They should be quite a deep pink with brown flaky bits. The more eyes they have the more potential shoots they have. Once you have made your purchase, it is important to turn your back and walk away. You can't save them all from the pot. Be thankful that you can give life to the few you were able to save. 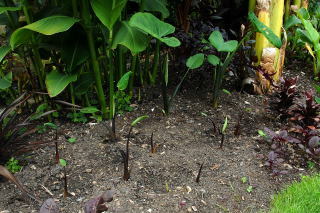 Next you need to plant your elephant ear tubers. Find a pot that will fit the tuber in horizontally. Put some multi-purpose compost in the bottom, lay the tuber on top and them cover with more multi-purpose compost. They seem to prefer being completely covered. Leaving the growing point sticking out of the compost seems to delay growth. Water sparingly at first. They do not like to be sitting in wringing wet compost at the early stages and can rot if left in standing water. It is best to start your elephant ear plants quite early. A little patience is needed before much happens. Warmth helps, either in the form of bottom heat from a heat mat or propagator. It is equally effective just having them in doors. However the pots will be 2 -3 litre in size and as such are not exactly suitable for window sill culture. If you do not have a green house then you will need to bring your elephant ear plants into growth indoors. By the time your plant has reached this stage it is ready to be planted outside. In fact they will race away as soon as they get into the soil. Make sure you wait until any risk of frost has passed. Prepare the soil with plenty of home made compost and composted manure. If you are going for a mass planting or planting in singles, plant them in a crater. Once in growth in the soil they like a lot of water. A good daily soaking during hot weather, less if things cool down, will keep your elephant ear plants in excellent form. If you ease off during hot weather your plants may develop brown margins and generally look unhappy. Literature often states that these plants can be grown in the shade. Whilst this is true, the reference is more for tropical shade which is hot, not temperate shade which is generally on the cool side. They will grow in the shade in cool climates but not as quickly or as large. Plant them in full sun somewhere where daily watering (when necessary) will not be a chore. A 'before and after' scenario. 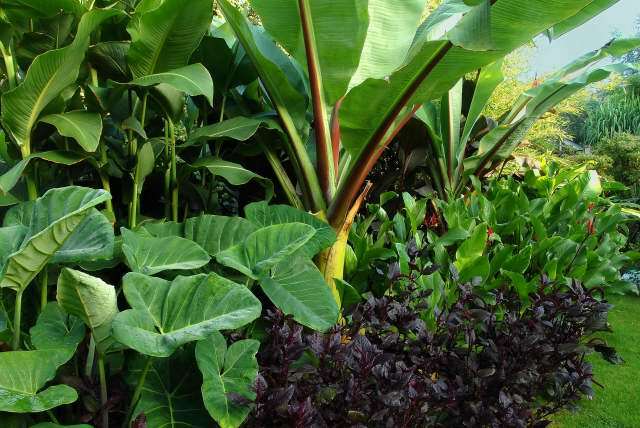 The foliage of the elephant ear plant has zero frost tolerance. Due to the low replacement costs the whole plant, tubers and all can be thrown on the compost heap. Some literature suggests the elephant ear tubers have a cold tolerance of zone 8b if left in the ground. Experience has shown that even after mild zone 9 winters all that remains of any tubers left in the ground is something resembling thick white paint. 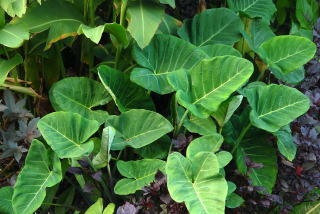 The elephant ear plant is more or less pest and disease free. Emerging shoots atract the odd aphid in the greenhouse but never reach epidemic proportions. These are easily controlled by finger or brush. The biggest threat to your established elephant ear plants is the summer hail storm. A 20 second hail storm can reduce the leaves to lace. More pictures featuring Cocoyam can be found here. The aquisition and propagation of the eddoe is the same as for the coco yam above . The leaves of the eddoe are smoother and carried on a more slender stem. It is quoted as being slightly more drought tolerant but neither plant thrives when neglected. One major difference is the price. Not only is the price per kg considerably less, the tubers themselves are much smaller. 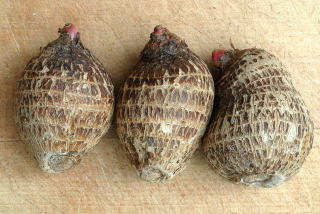 There can also be quite subtle differences in the plants grown from tubers bought in different shops. 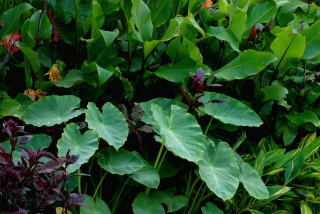 Dark stemmed elephant ear plants are quite common. 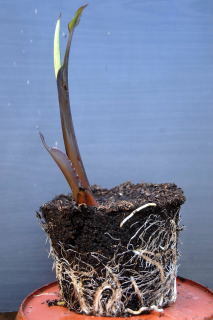 This picture shows three eddoes with the growing tip emerging. This is a good sign with eddoes. Occaisionally the tubers exhibit no signs of growth. These are best avoided. A good habit to get into is to drop by the shop on a regular basis, this way you can spot the new arrivals. Eddoes will sometimes be have several green shoots, if you see these grab them with both hands. These tubers are raring to go and will not disappoint.